Nhulunbuy is almost as remote as you can get, it takes a day and a half to travel there from Darwin in the dry season and is inaccessible by vehicle in the wet season (only flying in is possible). Located on the east coast of the Gulf of Carpentaria, the Nhulunbuy township is the major service centre for the vast and highly culturally significant region of East Arnhem Land and one of the richest bauxite deposits in the world. We worked with the Nhulunbuy Corporation on a Recreation, Facilities and Open Space Master Plan for the town in 2017 and provided a 10-year vision and action plan to improve recreation, sport and open space opportunities in the region. The plan has already delivered an upgraded Aquatic Centre, Skatepark and Town Square. A new Town Walk is nearly ready and we have been helping design the walk, wayfinding and interpretation signage. Nhulunbuy is in a period of transition following the curtailment of the operations at the Gove alumina refinery in 2014, stimulating the need for diversification of the local economy. The region has been home to the Yolŋu People for over 50,000 years and the the town is contained within a Special Purpose Lease area on Aboriginal freehold land held by the Arnhem Land Aboriginal Land Trust, represented by the Northern Land Council. 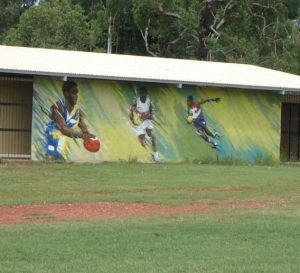 During our trips to Nhulunbuy we focussed on talking with the diverse range of stakeholders, locals and visiting the town’s incredible range of sport and recreation facilities. There is something special about this town – families move here for work but end up staying for the lifestyle. So many love and appreciate the adventure, sport and recreation opportunities on offer. Nhulunbuy’s network of recreation facilities and open spaces is impressive and diverse considering the town’s isolation and smaller population base. With recent population decline the town now has about 2,100 people and still has the facilities which catered for the peak population of 4,700 in 2009. The challenge ahead is providing a sustainable level of facilities for the smaller population, while recognising the role of Nhulunbuy as a regional centre for the Aboriginal communities distributed across East Arnhem Land. For example, the Nhulunbuy Aquatic Centre is of key importance to ensure that people across the region have the opportunity to learn to swim. The plan we prepared has already delivered a range of positive community outcomes, starting with an upgraded Aquatic Centre, Skatepark and Town Square. The signs for the Town Walks are currently being manufactured and we can’t wait to see them in the ground – encouraging locals and visitors to get active and be guided to key sites including a number of Indigenous Protected Areas. At Tredwell we have worked in communities all over Australia which are experiencing a period of transition. We love the opportunity to work in remote places and see community outcomes delivered through working with the community to strategically plan for sport, recreation and open space. With flights from Darwin or Cairns, or a 710km 4WD journey from Katherine, it’s not exactly easy to get to – but a visit to Nhulunbuy and East Arnhem Land is well worth the effort!